Not supplied with batteries so pick some of those up too while your there. 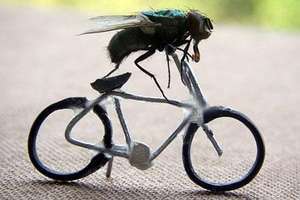 Heat for the blue-bottle on a bike pic..
Everyone knows a fly prefers to ride horseback! This has transformed my kids from "Dad Urggh theres a fly" to "Yeah!! dad theres a fly!!" its the new sport for us. unortunatley for some though the flies can make a loud pop sound when they are zapped, they can flash and smoke and you can get a brief smell of "Mmmmmm Cooked fly!". Its a great find for us though and anyone we show it to wants one and cant beleive they are just a £1. I've seen these in action and think they'r good for the money, a friend of mine had one and seemed to get great pleasure out of finishing off the flies in his house. I must say though it did remind me of an accessory you get for the Nintendo Wii! Have some heat..
Just the job as these pests can take serious punishment, If a thorough whack equivalent to us being hit by a train doesn't seem to harm them then an electric shock sure will! i bought 3 of these things from Poundland (so hope the ones here are better) and they weren't that great. they only kill clothes moths and very little flies instantly, ive tried it on normal moths and a wasp and a bluebottle and they just tighten up as if they're being tazored and then come back ok and fly away. i used brand new batteries and it makes a scary spark when u touch something metal with it but for insects its crap. think it must be do do with how much power it uses. think you have to spend money on a decent one to get the results you see on youtube! Is this for the Xbox 360 or just PS3? im more suited to a baseball bat anyone know where i can get a leccy one of those?? Will this work on my missus to get her off her ****? These are a must for camping trips to nail all those pesky blighters before bedtime! (the flys not the kids). Fly's have feelings also ! They have as much right to be here as we do ! Save the Fly's ! Get a glass and cup the fly in it and deposit it outside, simple and it gets to go home to baby fly and mummy fly later and tell them how nice the humans are, if we were all nice to them they might not pester us so much ? Did have 1 of these,, it's still quite hard to swat them as they fly away from it too fast. The only best technique is to trap them when they're on a flat surface/against a wall. Take out the batteries and wire it into the mains for extra zap. Did have 1 of these,, it's still quite hard to swat them as they fly away … Did have 1 of these,, it's still quite hard to swat them as they fly away from it too fast.The only best technique is to trap them when they're on a flat surface/against a wall. Voted cold as this is far too niche a product. I've never seen an 'Electric Tennis Racket Bug' therefore the purchase of an 'Electric Tennis Racket Bug Zapper' would be pointless. I suppose for people going on holiday to wherever the Electric Tennis Racket Bug is native this may be a worthwhile purchase but for most of us I fear this product is redundant. cold, the dail mail is only 50p, and I dont need batteries for it. Mine came with batteries, I bought it 2 months ago! 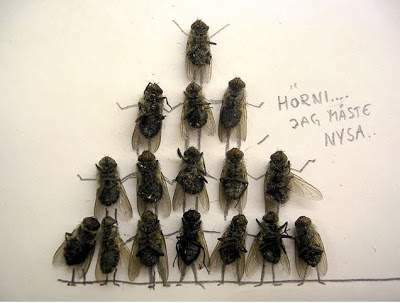 Fly's have feelings also ! They have as much right to be here as we do ! … Fly's have feelings also ! They have as much right to be here as we do ! 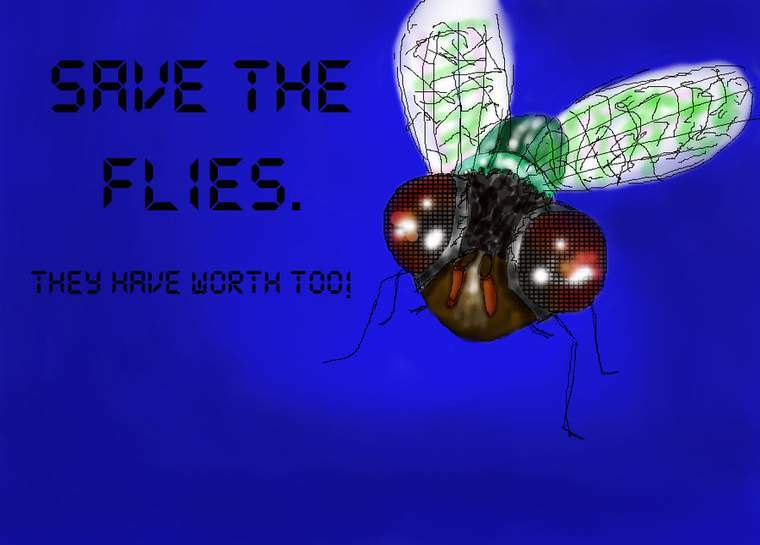 Save the Fly's ! Get a glass and cup the fly in it and deposit it outside, simple and it gets to go home to baby fly and mummy fly later and tell them how nice the humans are, if we were all nice to them they might not pester us so much ? Just missing the 'do not try this at home' warning !! I'm concerned that there's a chance you could be serious! PS what's the apostrophe in 'fly's' for? Got a Poundland one & it's fab. My dd got a wasp with ours today. Like to try to just stun flies so I can feed them to our pet mantis - they have to be alive to interest a mantis. Best pound ive ever spent.. If you catch em just right it sends them into a crazy breakdancing routine where they seem to back spin for a good 30 seconds...... "priceless!" True, but on the downside you own a copy of the Daily Mail. Yes, but the daily mail is more effective as it comes injected with venom. Exactly! If someone comes into MY house uninvited, starts eating my dinner after crawling around in dog faeces then starts getting up in my face, you better believe they're getting a slap with an electrified racquet.